Yellow poplar weevils, also known as sassafras or magnolia weevils, are small black beetles that damage yellow poplar, sassafras, and magnolia. A distinct snout projecting from the front of the head occasionally causes them to be mistaken for ticks. Adults leave distinctive pockmark-type feeding pits in leaves (Figure 1) that resemble curved rice grains in size and shape. Intense feeding may cause much of the leaf to turn brown. This insect occasionally becomes abundant enough to cause visible injury. 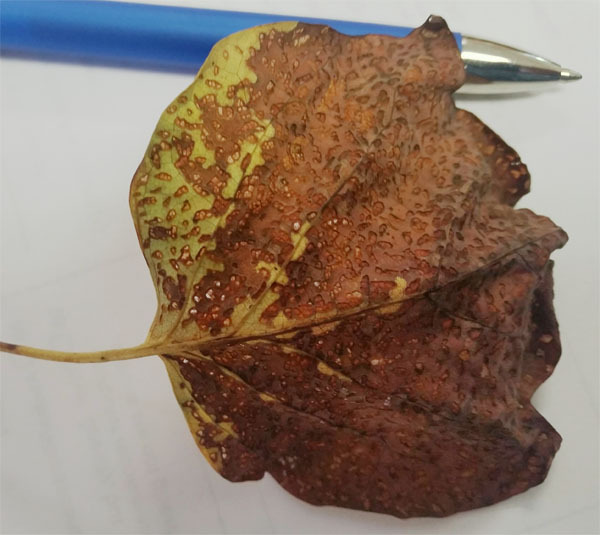 In addition to damage done by adults, larvae feed as internal miners, causing areas of dead leaf tissue in poplar and sassafras leaves. Combined larval and adult activity can cause significant leaf loss. Healthy, established trees usually can tolerate the infrequent damage seen with this insect. There is one generation of this insect each year. Adults pass winter in leaf litter and begin to feed on warm days in late April and May. Before bud break, weevils attack swelling buds and leave their distinctive feeding marks. As leaves unfold and enlarge, they, too, are fed upon. Holes in leaves (about 1/8 inch in diameter) result from adult weevils puncturing buds or feeding on lower surfaces of leaves. Mating and egg laying occur in May and early June. Eggs are placed in midribs on undersides of leaves. This injury can break leaf midribs. Newly-hatched larvae move from midribs into leaves where they feed as leaf miners. When ready to pupate, larvae move to inflated portions of the mines and spin silk cocoons. New adults begin to emerge from leaves during the second week of June and feed on foliage. Sometimes they chew through leaves, but more often they remove only the lower epidermis and mesophyll, leaving the upper epidermis intact. This produces many chlorotic spots and results in the scorched appearance of severely attacked trees. Feeding by newly emerged weevils can be severe. Leaf drop occurs when damaged trees are also under drought stress. By mid-July adults have disappeared to their hiding places in leaf litter and will remain inactive until spring. Tree and shrub insecticides may be used to reduce damage to foliage. Treat when feeding damage is seen on about 10% of the branches and repeat as necessary. 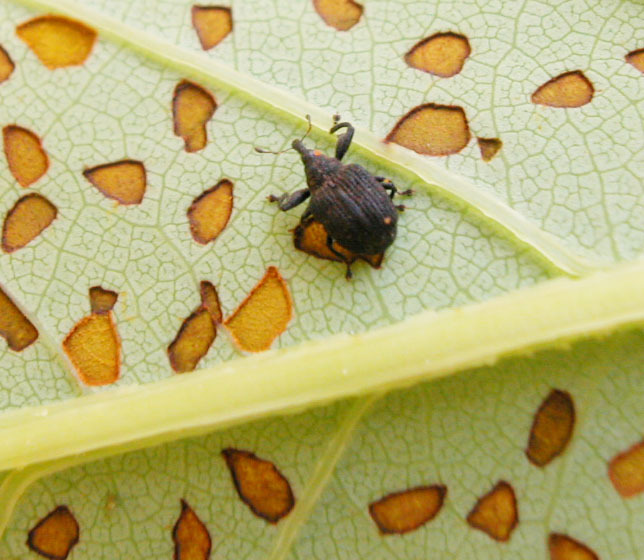 Weevils arrive on trees over an extended period of time; treating at the very first sign of damage may be premature and require an additional application in a few days. While the damage may be unsightly, injury to large, established trees in landscapes or wooded areas probably will not harm the trees.